We are sitting down with author, W.K. 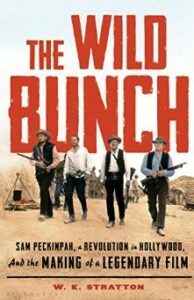 “Kip” Stratton this week regarding his new book, THE WILD BUNCH Sam Peckinpah, a Revolution in Hollywood, and the Making of a Legendary Film (Bloomsbury, Feb. 12, 2019). Writing on the Air is broadcast Wednesdays from 6-7pm Central from the KOOP Radio studios in Austin, Texas. We’re heard on 91.7FM KOOP – Austin and streaming online at KOOP.org. You can also listen online at TuneIn.com and Radio Free America. Episodes are available in our Radio Free America archive for two weeks after broadcast. We invite you to browse our previous episodes here on our website; you can download the audios from each page. You’ll also find our podcast on the Podcasts ap/ iTunes and Spotify. Episodes maintain in the KOOP Radio Free America archive for two weeks after broadcast. W.K. 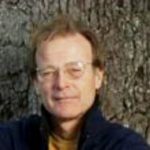 “Kip” Stratton is the author of six books of nonfiction and three of poetry. His latest nonfiction book is THE WILD BUNCH Sam Peckinpah, a Revolution in Hollywood, and the Making of a Legendary Film (Bloomsbury, Feb. 12, 2019). https://www.amazon.com/Wild-Bunch-Peckinpah-Revolution-Hollywood-ebook/dp/B07FLF4GNZ about the classic American movie The Wild Bunch and its director, Sam Peckinpah. 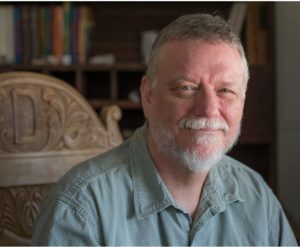 Kip has written for Sports Illustrated, Outside, GQ, and Texas Monthly, and was named a Fellow of the Texas Institute of Letters in 2017. He is also a member of The Authors Guilding, PEN Center USA and Western Writers of America. A native of Guthrie, Oklahoma, Kip is a longtime resident of Austin. For more information, please see his website. Sam Peckinpah’s film The Wild Bunch, named one of the greatest films of all time by the American Film Institute, is the story of a gang of outlaws who are one big steal from retirement. When their attempted train robbery goes awry, the gang flees to Mexico and falls in with a brutal general of the Mexican Revolution, who offers them the job of a lifetime. Conceived by a stuntman, directed by a blacklisted director, and shot in the sand and heat of the Mexican desert, the movie seemed doomed. Instead, it became an instant classic with a dark, violent take on the Western movie tradition.